This past February the biomass experts met at the traditional energy saving fair in Wels, Austria. Our participation this year was focused on the brand new pellet boiler Pellematic Condens. 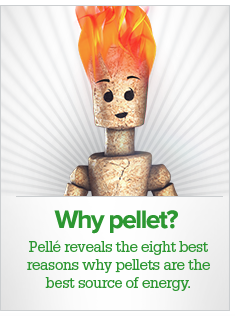 In 1997, the boiler market was revolutionised by the Pellematic, the first fully automatic pellet boiler. Now the Pellematic Condens is setting a new benchmark. The Pellematic Condens unites almost 20 years of experience in developing and manufacturing pellet boilers with the very latest technology. Along with the company's renowned technology for controlling combustion, this pellet boiler is also equipped with the new, pioneering Condens condensing technology. The boiler can be easily integrated into any heating system, which recasts the practicality of pellet condensing technology. This is a new pellet condensing boiler which opens a completely new dimension for the installers.